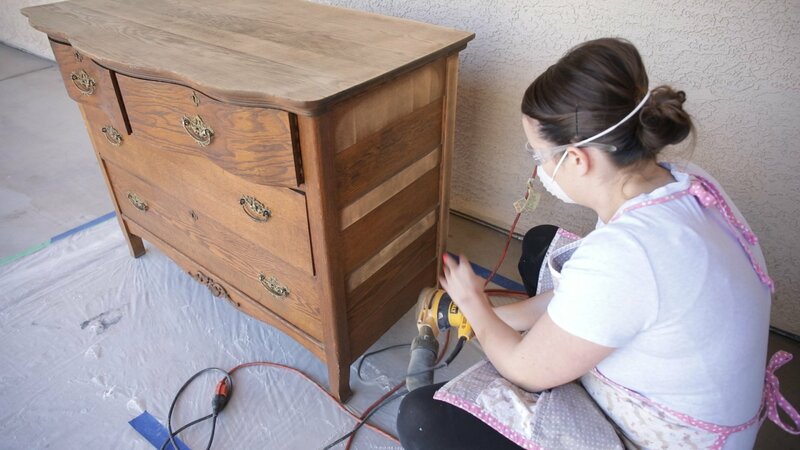 How to Milk Paint Furniture-Prepping for a Chippy Finish! Welcome back! If this is your first time reading I am so happy to have you here! for 7 weeks we have been talking all about how to paint furniture! 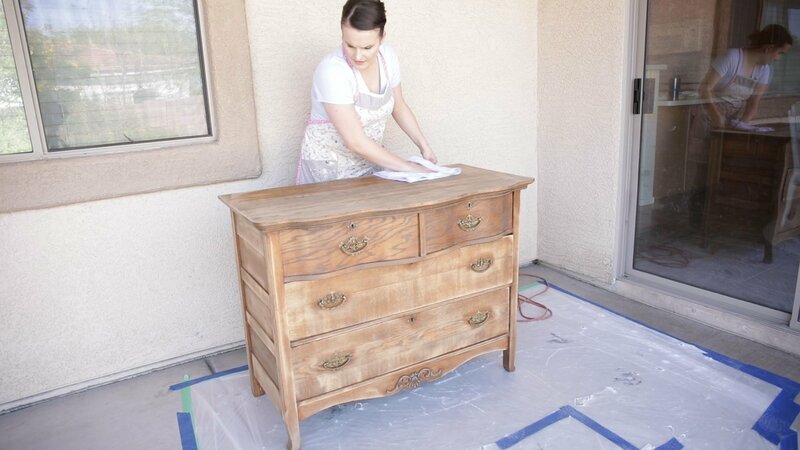 We just wrapped up our first project where I painted a dresser using chalk paint. You can link to each of the posts you’ve missed and get caught up HERE. But today we are diving into Milk Paint. Specifically how to milk paint furniture for a chippy look. I have been painting furniture for about 6 years and in that time I have experimented with a lot of different paints. It shouldn’t come as a surprise that with different paints you get different results. For that reason I have different paints I pick for different reasons. 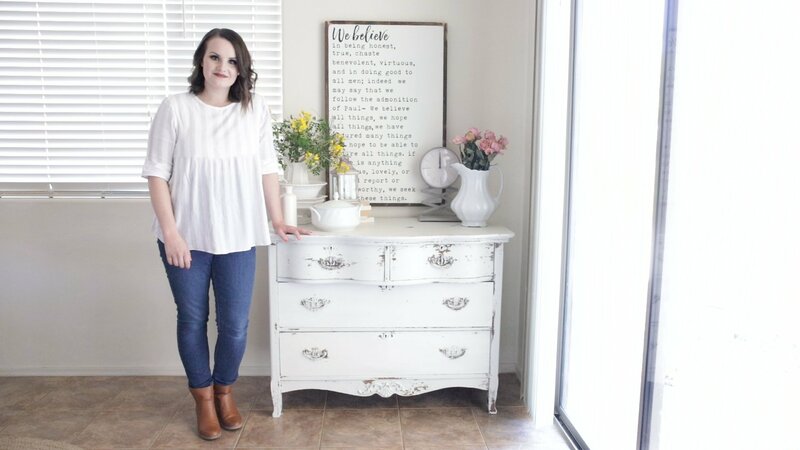 When I’m looking to achieve a very chippy painted look milk paint is my go to! Why? Its one of very few paints chalk paint not included, that will actually chip on its own. Yes you read that right it will literally chip and flake off your furniture in areas as it dries. It makes getting that authentic vintage weathered look effortless. I find that when I attempt to achieve this very distressed look with chalk paint, it looks over done and not as natural. The colors of milk paint are also very different than that of other paints. I use Miss Mustard seeds Milk paint. I am not partnered with her its just an amazing product and I will continue to use it over and over! Milk paint fro her line comes in a bag and is in a powder form. You actually mix the powder with water before you begin to paint. Because its a powder and is prepped in this way, it actually allows the paint to have so much more depth and variation. I love this about it and find that it truly creates the most unique and special painted pieces of furniture. For these reasons I am very drawn to milk paint and recommend it to you for your painted projects as well! As I just mentioned milk paint is an incredible medium and I do use it often. However I do not think its the right paint for every piece of furniture. 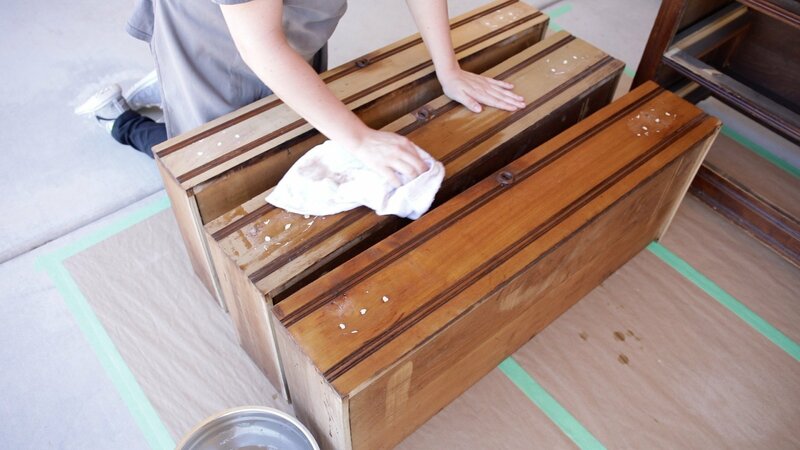 Because the paint does chip off its important to only use it for pieces that will take the milk paint well. I would discourage using milk paint on anything that isn’t solid wood. I also think the right prep can help you achieve the best results. So carful consideration should be taken while prepping your furniture. Today I’m gonna share those prep work steps so that you end up with a chippy piece that’s not overly chippy and you love! In a future post I’ll dive into using a product called bonding agent. This is used to get a more full coverage non chippy application when using milk paint. But my favorite way to apply milk paint is without the bonding agent so these steps will be specific to not using bonding agent. The first thing you should do before you prep is make sure any thing that needs to be patched up and fixed is taken care of. I always paint second hand furniture so this is often necessary to add a little wood putty or reinforce the bones of a piece of furniture. Once again your piece must be solid wood for the best results. These are the tools and types I use and recommend linked above!? I really like to sand down each piece before I paint it with milk paint. I’ve tried a lot of the “no prep” paint and even with paint that boasts no prep work required before painting. Regardless I always always, prep my pieces. I do this for a couple reasons. Because I mostly purchase second hand furniture, its often riddled with scratches, dings and nicks. Sanding helps easily smooth those imperfections away! Most pieces have some sort of a finish on them. I find I get the best results when I sand and buff that down every time especially with milk paint. 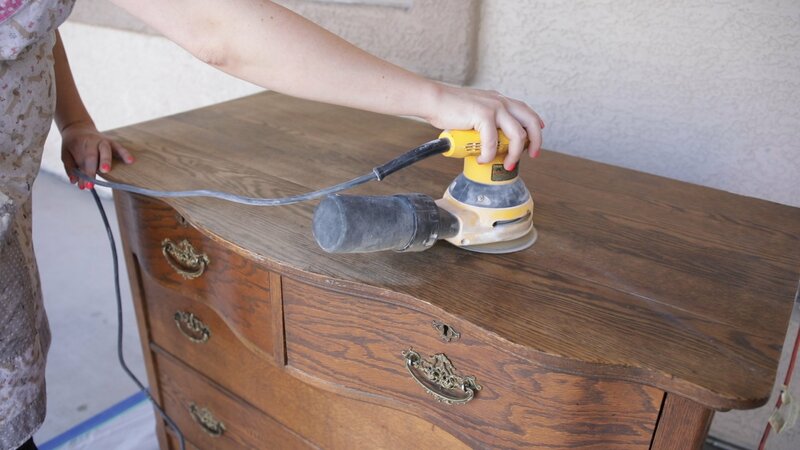 Often times there is a funny residue or oily texture to furniture sanding also really gets that off. I find that when I take the extra time to prep furniture the results are always so much better! 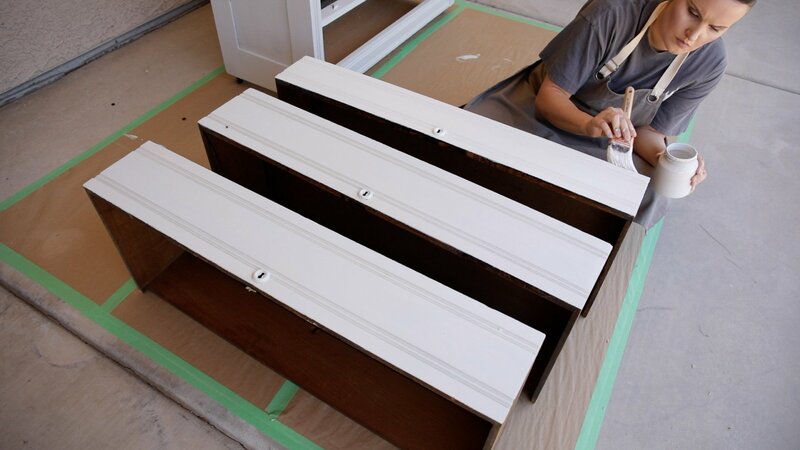 If you’ve had lack luster results with painting furniture this may be a step that could help with that! Now that you have the right tools and you understand why prep is important its time to dive in! I start at the top and work my way down. It’s just how I do it and keeps things streamlined and I get the job done faster. I always start with my orbital sander and my 80 grit sanding pad. Working with the wood grain and not against it (if I can help it) I begin to sand with my orbital sander. Very lightly covering the entire surface of the piece. Take care not to sand with my orbital sander in inside corners or any of the finer details curves etc. Those can be easily damaged by the orbital sander. Once I have covered all the flat surfaces with my orbital sander I give it a good rub down with my hands. Its the easiest way to determine if everything is smooth and all the scratches and dings have been sanded away. Once I’ve determined the main surfaces are done, I take my 220 fine grit sanding pad and go over all those areas again. This makes for a buttery smooth finish and the paint is going to go on like a dream! Next I take out my foam sanding block and carefully sand all those inside corners. I sand the special details curves and unique designs that an individual piece may have. A foam sanding block is the best tool for this job because its pliable. It will form around little details and get in little nooks and crannies with out much effort. Its also gentle enough to not destroy those details in the process. 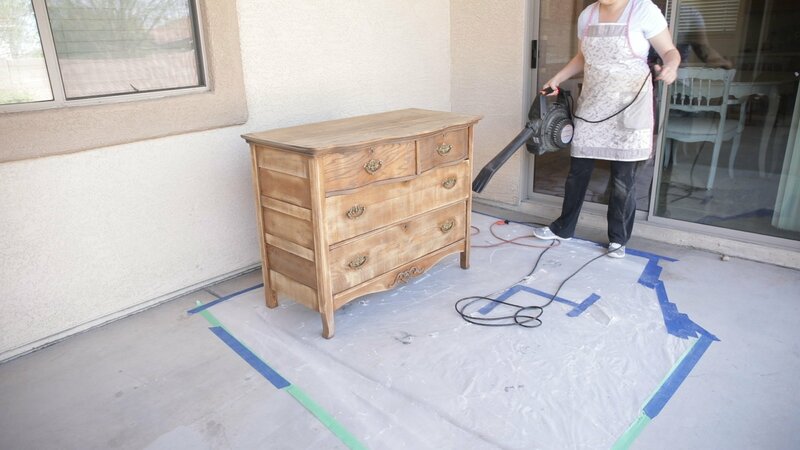 By this point every square inch of your furniture should be sanded. 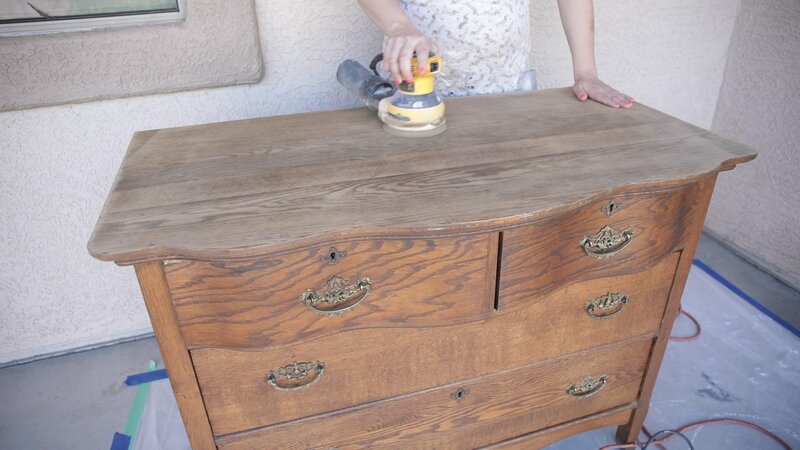 Once sanding is complete Its time to clean up your furniture. Cleaning your furniture is a very important step. If you leave the dust before painting it can mix with your paint and cause it to discolor and apply unevenly. I use my shop vac which is a two in one tool. I take the top portion off and it becomes a leaf blower. Or in my case a furniture blower! I simply blow all the dust away (take care to do this out side). Once the dust has been air blasted off. I take an old damp cloth and really clean off the excess dirt and dust. You may need to clean out your rags several times for this step to be effective. That’s it you’re done! Let the furniture completely dry before going in with paint! 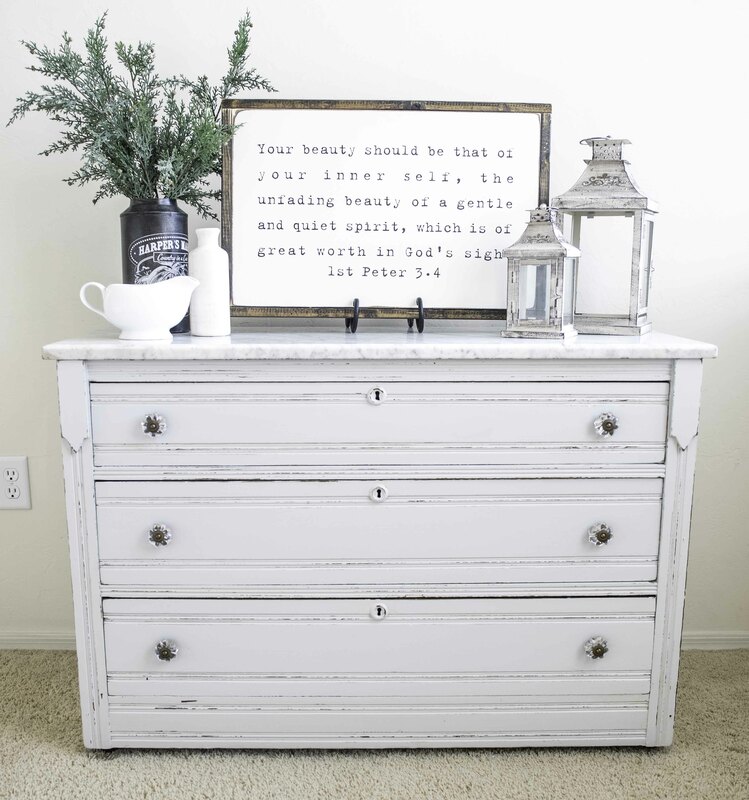 We will cover paint next week and I can’t wait to show you how amazing milk paint is!